Ever wanted to buy Ether from a stranger online or in person? Now’s your chance to do it quickly and safely with LocalEthereum.com. LocalEthereum is a decentralized application (“DApp”) that enables peer-to-peer exchanges of Ether for fiat currencies such as Canadian and US dollars. You can use it to link up directly with people on the internet who want to sell Ether for fiat currency and securely complete trades using LocalEthereum’s secure messaging system and escrow smart contracts. You can buy your Ether with e-transfers, bank transfers or even meet the seller in a coffee shop and pay in cold hard cash. Once your trade is complete, all of the Ether you just purchased is stored in a personal Ethereum wallet on the LocalEthereum website. This makes it easy to buy your first few Ether and get into the cryptocurrency scene if you are not already familiar with it. All in all, it took me about 30-50 minutes to buy Ether from LocalEthereum and transfer it to Metamask so I could start using DApps like UppstArt’s decentralized marketplace for original art. I could explain all the technical details, but it’s probably more clear if I just tell you about my experience. When I visited the LocalEthereum landing page, it quickly determined that my location was in Canada and helpfully offered me some choices for purchasing Ether locally. It gave me the option to purchase Ether in Canada via cash (in person), e-transfer, bank transfer or cash deposit. I selected the e-transfer option because I am familiar with e-transfers. I also wanted my Ether quickly and I would only be purchasing a small amount of Ether that was well below the limit for e-transfers. The site then directed me to a listing of the “top sellers” in Canada who were willing to sell Ether via e-transfer. I chose the #1 seller because they had over 300 trades and had a great reputation on their profile page. If I was buying thousands of dollars worth of Ether, then I might try to shop around or negotiate a better premium. However, the premium was peanuts for the small amount I was buying so I decided to pull the trigger. 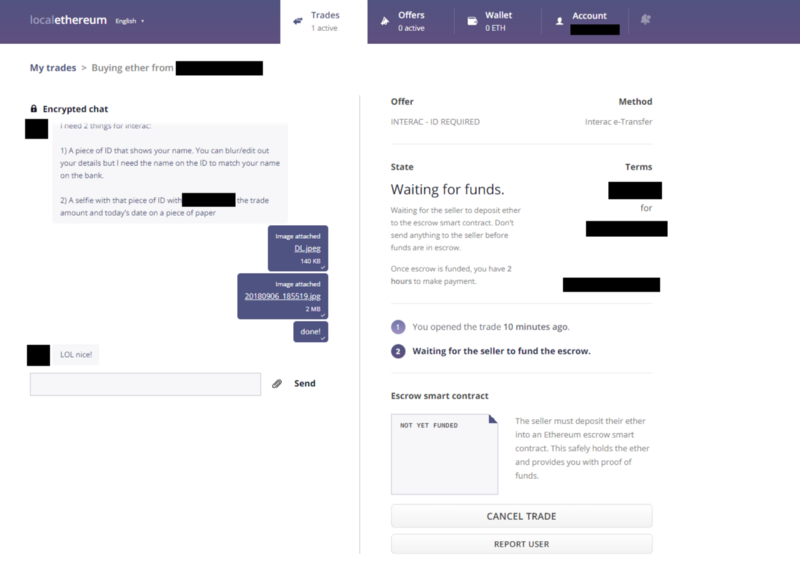 When you start a trade, all of your chat messages with the seller are encrypted to protect your personal information. According to LocalEthereum, the only case where they can read your chat messages is if the buyer or seller raises a dispute (which is very infrequent according to the company). The seller promptly responded to me within about 5 minutes and asked for some information to verify my identity, including my drivers’ license (with personal information blurred out) and a selfie of me holding up a piece of paper with the seller’s username, the date and the amount of the trade. At first I thought this seemed a bit excessive, but when I got chatting with the seller he informed me that he had been defrauded a few times in the past by shady buyers. In addition to the risk of chargebacks and reversals, problems can arise if someone is using a hacked bank account to buy Ether on LocalEthereum to launder the stolen funds. Good on this particular seller for confirming that I’m not a bad guy! After chatting with the seller briefly and adding each other on Linkedin, I was sufficiently confident to go through with the trade, so I sent him my driver’s license and the requested selfie and we were off to the races. Technically, LocalEthereum is not 100% trustless. The buyer and seller still need to trust each other, which is why the encrypted chat is a great tool to share documents and get to know each other a little bit. You also need to trust LocalEthereum to arbitrate disputes impartially. However, it is mostlytrustless, and the company pays a lot of attention to becoming more trustless over time. In my view “mostly trustless” is completely fine for Ethereum DApps these days, especially if they are dealing with exchanges of cryptocurrency for non-crypto assets like fiat currency. Once the escrow is funded on LocalEthereum and the buyer confirms payment, the Ether can only be removed if the seller releases it to the buyer or a dispute is raised and brought to arbitration. This is to protect the buyer from making a payment but not receiving the Ether. At this point I knew the Ether was in escrow, so it was now safe to pay the Seller. I sent him an e-transfer for the correct amount and when he received it, he released the Ether to me. The Ether you purchase on LocalEthereum is stored in a wallet that is automatically generated for your account, so there is no hassle with setting up your own wallet address ahead of time. I love this feature because it makes it easy to use for people who may have never used cryptocurrencies before. However, it is best practice in the crypto world to promptly transfer your Ether to a more secure storage wallet such as an encrypted hardware wallet or a paper wallet. All in all, LocalEthereum did everything I wanted it to do. It was quick and easy to set up an account and find a reputable seller. Communicating with the seller was private, easy and fun. The Ether was held in escrow before I even initiated payment, and I knew that it could only be released if the seller paid me or a dispute was raised. Most importantly, I was able to get my Ether quickly and safely without needing to go through a complicated KYC process at a crypto exchange. I have not tried to do any trades on LocalEthereum in person. I imagine this method of payment would come with some additional safety measures such as meeting in a safe, public place and bringing a friend. However, I would absolutely recommend using it if you are looking to buy small amounts of Ether via e-transfer. Have you used LocalEthereum or any other over-the-counter crypto exchanges? Let me know about your experiences in the comments. For full instructions on how to use LocalEthereum, click here. Steve Gow is a DApp architect, lawyer, writer, art lover and the co-founder of Adappcity Inc. and www.UppstArt.io. UppstArt is an online marketplace for original artwork that tracks provenance on the Ethereum blockchain and pays resale royalties to artists every time their art resells on the secondary market. It is the only place you can buy original, physical crypto art online and resell it whenever you want on an Ethereum DApp. Steve’s mission is to build high social-impact decentralized applications that bridge the gap between ordinary people and the world of cryptocurrency.